Instagram’s star is rising, and it’s no surprise. As a social media platform, it’s hard to compete with its value as a brand promotion platform for companies and businesses of almost all types and sizes. Instagram Stories has added a new and exciting short video element to the format, and the hashtag and @-tagging capabilities remain a robust way to connect users and potential users to brands. While simply posting regularly (though always creatively) to Instagram will certainly keep you in front of the public eye, your follower list may plateau or even decline if you don’t employ clever tactics to keep it growing. One way to gain Instagram followers that’s virtually foolproof? Contests! The first — and classic — Instagram contest idea? Selfie photos, naturally. Instagram practically invented the concept of the selfie, and it’s still the medium’s classic shot. By this point we’re all so familiar with that pose of a user holding his or her phone somewhat awkwardly at arm’s length. The winners were awarded with flight tickets. The video alone put the company in front of 130 million new sets of eyes. Since entrants already have your product, you may have to come up with a more enticing prize! You’ll want to make it relevant to your brand, however. This is a common mistake companies make: they give away prizes that have nothing to do with their brand, thinking they’ll get more entries that way. For consumables, giving away larger quantities makes sense… but if it’s a durable good, this may not be a workable contest for you. Another almost instantaneous Instagram classic from the earliest days? The artful shot of a chef-prepared meal, taken by the ardent foodie. The clever restaurateur will take advantage of this with well-placed table placards and menu mentions with their restaurant-specific hashtag, winner to be chosen weekly, with potential prize being a gift certificate or t-shirt. Managing that CTA. Restaurants are busy places, and handling a weekly contest, the entrants, and its winners — as well as dealing with changing the dates on marketing materials — could get unwieldy. This one’s not quite as much of a contest as the others, but still encourages Instagram follower engagement. You post several pictures and ask your audience to vote for their favorite. You can ask them to vote by liking, commenting, or making a post with a special hashtag. This has to do with the contest prize, and not the structure. Here you appeal to your fans’ higher principles by making the prize be a donation to charity, or a charitable act made on behalf of the brand, or something else. You could promise to increase donation based on number of likes, comments, reposts, etc. You could post pictures of things you’re donating, and offer more based on engagement. Don’t underestimate the power and reach of this sort of contest. Think of the ALS Ice Bucket Challenge, which ended up generating $115 million to Compassionate Care ALS, an organization that does great work in providing care to victims of ALS and their families. Check out our guide to sponsored Instagram posts if you’re looking for promotion without inventing the most viral campaign of the year. Actually does benefit people and causes! Exercise care to not engender a cynical response from followers through lack of authenticity. Maintain transparency of donations so that all funds can be traced directly to the charity. An altruistic way to go with the Instagram contest idea is the @-tag nomination concept. Perfect for holiday gift baskets, spa packages, trips, gym memberships, mother’s- or father’s-day “pampering” ideas, new mom gifts, manicure/pedicures, hair salons, the list goes on and on. The idea is simple: you suggest to your followers that they @-tag a deserving friend, colleague or family member for the prize. People feel good about entering; it’s a small endorphin hit at no cost. 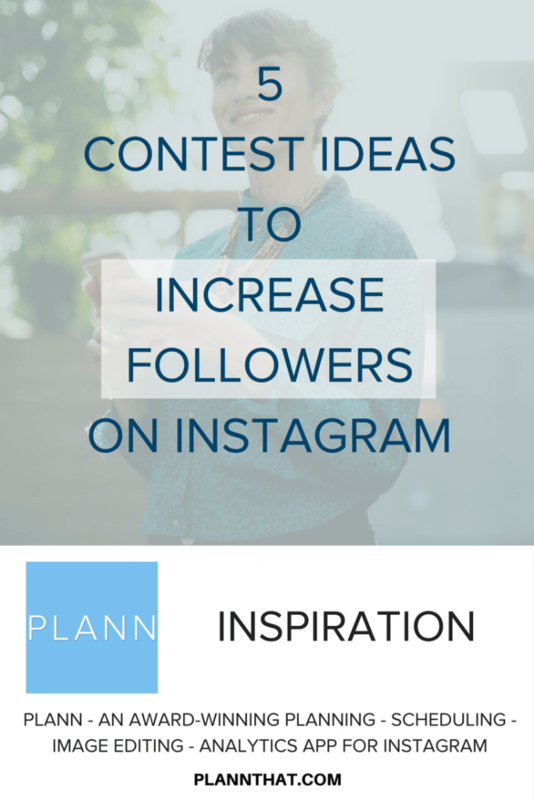 These are just a handful of fun ideas for getting folks engaged with your Instagram feed through some simple Instagram contests and giveaway ideas. Thus, followers can be more inclined to interact with you in a way that works best for your brand. Whether you’re a brick-and-mortar store, a service provider, a durable- or a consumable good, there’s an Instagram contest that will work for you. Hope these best practices will prove helpful for you. It’s easy to give your Instagram following a boost on a regular basis by employing these techniques. Best of all, they can be translated (with some adaptations) onto other social media platforms as well. Ready to kick up your Instagram posting game? Subscribe to our newsletter to stay up on the most effective Instagram trends of the now. Download Plann for iOS and Android and take your Instagram game to the next level! PreviousPrevious post:Creative Instagram Accounts: 10 Inspirational Feeds To FollowNextNext post:What is Instagram Archive and Instagram Highlights?